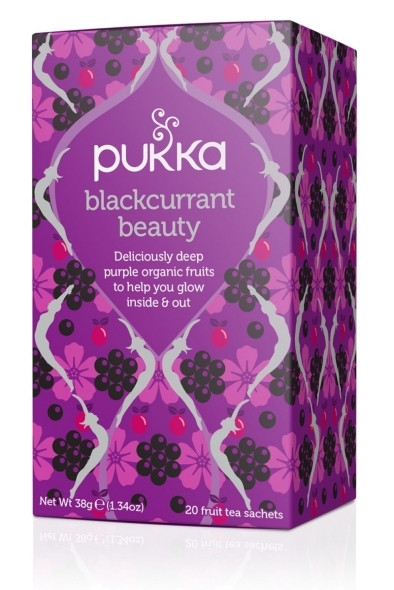 Blackcurrant Beauty tea is an organic blend of deliciously deep purple organic fruits to help you glow inside & out. Juicy blackcurrants swirl with sweetly dark beetroot. Then the natural power of hibiscus flowers and rosehips breathe life from the inside out while the mellow fruitiness of orange peel protects. Deliciousness knows no deeper colour. 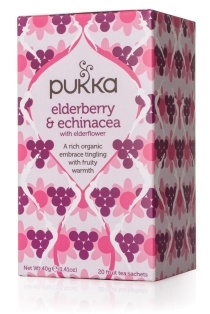 Naturally caffeine-free and ethically sourced ingredients: Rosehip*, hibiscus flower*, licorice root*, sweet fennel seed*, orange peel*, beetroot*, blackcurrant fruit* (4%), natural blackcurrant flavour (4%), orange essential oil flavour*. (*organic ingredients (99.9%)). 36% FairWildTM certified ingredients (rosehip, licorice) by dried weight. 50% fair trade ingredients certified by IMO according to the Fair for Life Programme – rosehip, licorice, fennel. 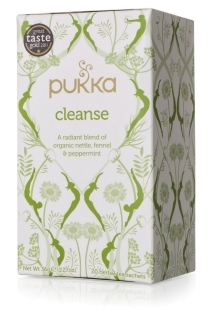 Pukka uses sachets to protect the high essential oil content of their incredible organic herbs to bring you the fullest flavour.